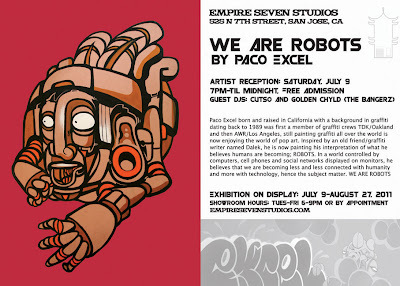 This Saturday between 7pm and midnight, Empire Seven Studio is hosting an artist reception for graffiti artist Paco Excel. His latest work focuses around how people are becoming more connected with technology than humanity (appropriate theme for Silicon Valley, don't you think). This exhibit will also be on display at Empire Seven Studios on 7th Street until August 27th, which is open 6pm-9pm Mon-Fri.